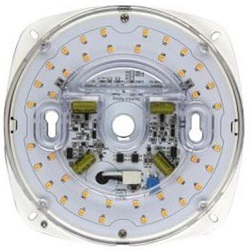 The MaxLite LED Flush Mount Retrofit Kit/Light Engine can be used to retrofit existing luminaires, or as a high quality light source in new luminaire designs. As a retrofit product, the kit provides residential and commercial property managers a unique opportunity to upgrade to the latest LED technology while avoiding the inconvenience and costs with replacing unique existing ceiling fixtures. The ENERGY STAR certified kit is also an ideal solution for the OEM market, delivering superior 90-plus CRI across a full range of wattages/diameters. The MaxLite design may be used with any diffuser type, permitting much wider application than competing designs.